Does your child ride in car seat or a booster seat? 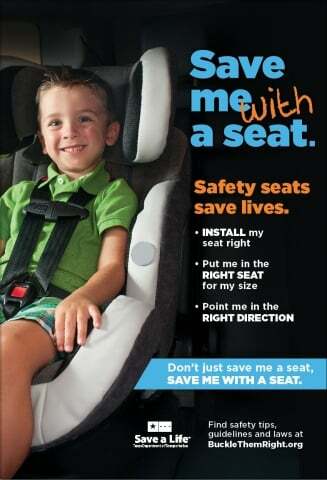 Are you familiar with TxDOT recommendations and guidelines for child seats? Did you know-TxDOT recommends that all children under age 13 ride in the back seat? Motor vehicle crashes are a leading cause of death among children. Maybe you use a child seat or a booster seat, but are you using it correctly? Is it properly installed? Do the grandparents or babysitters know how to use it? The National Highway Traffic Safety Administration (NHTSA) has found that 2 out of 3 safety seats are not used correctly. The Texas Department of Transportation is joining safety advocates statewide to remind parents of the importance of always buckling up their children. That means not only making sure they’re secured in their vehicle, but also avoiding the most common mistakes when it comes to child safety seats: failing to select the seat that is appropriate for the child’s age and size, and failing to correctly install it.